he first bishop of Palm Beach lived in the small house next to the cathedral. The second bishop traded up to a big house. The third bishop traded up again, to a bigger house. And then a fourth bishop, Sean Patrick O'Malley, arrived. O'Malley took one look at the bishop's residence in Florida and decided it was too much for him. He gave the big house to a group of nuns and moved into the small house next to the cathedral. Now, as O'Malley prepares for his July 30 installation as archbishop of Boston, he faces a similar decision: whether to live in the grand house in Brighton built 75 years ago for the bishops of Boston or move to humbler quarters, prompted by his vow of poverty and the church's dire financial straits. The rector of the Cathedral of the Holy Cross, in Boston's South End, is inviting O'Malley to move there. Boston College, the Catholic institution across the street from the archdiocese, is offering to buy the Brighton house and surrounding acreage. And many Catholics have said they would like to see the archbishop live somewhere other than the traditional residence, if only for symbolic reasons. O'Malley could move to any number of places, but there are two obvious options: He could move into the chancery, an office building just down the hill from the residence, which has apartments that have been used by auxiliary bishops. Or, he could move to the rectory at the cathedral, now home to four priests and a brother. The bishop's residence itself is heavily mortgaged as part of the collateral for a line of credit of up to $38 million that the archdiocese took out from the Knights of Columbus, so its equity, if sold, is limited. But the house is located on a 60-acre property owned by the archdiocese on the Newton-Brighton line that also includes the chancery, which is the main archdiocesan office building, a library, a tribunal building, and the campus of St. John's Seminary. The property is coveted by Boston College, which needs room for growth and has expressed a willingness to pay tens of millions of dollars for the land. O'Malley has a long record of preferring modest residences, both in Washington, where he began his work as a Capuchin friar, and in the Virgin Islands, where he first served as a bishop. And he has already signaled his desire to live simply in Boston. O'Malley is on vacation and could not be reached for comment about his intentions. An archdiocesan spokesman, Rev. Christopher J. Coyne, said he expects O'Malley to arrive in Boston by July 22 and to begin his tenure staying in the bishop's residence at 2101 Commonwealth Ave. until he decides where to settle. Coyne said the house has been unfairly portrayed in the news media. The main floor of the residence is used largely for entertaining and office work -- it features a conference room and dining room, a chapel, a kitchen, and several offices for the archbishop's secretaries. Boston Catholic Television broadcasts a daily Mass from the chapel. The basement level is now occupied by a church agency charged with child protection; the second floor has four bedroom suites, for the archbishop, his two secretaries, and a guest. A fourth floor until recently was occupied by four nuns from Les Soeurs Sainte-Jeanne d'Arc who took care of the house and its occupants. The nuns recently returned to Canada. Coyne has support for the argument that the house is not a mansion. But a priest who has been in the residential quarters said that part of the building is ''like a penthouse at the Ritz,'' and features marble and mahogany appointments added around the time of Law's arrival. ''It's not opulent in the sense of gilded, but everything is beyond top-shelf,'' said the priest, who asked that his name not be used. Coyne declined to give a Globe reporter and photographer a tour of the building. O'Malley has a record of eschewing fancy quarters. In Washington, where he worked from 1973 to 1984, O'Malley always chose low-key residences. ''For a while, he lived in a run-down apartment where the Spanish Catholic Center was located at the time,'' said Susan Gibbs, spokeswoman for the Archdiocese of Washington, who said O'Malley then lived at Capuchin College, his order's house of formation. In the Virgin Islands, where he was bishop from 1984 to 1992, O'Malley moved from a bishop's residence to the cathedral rectory. In Fall River, where O'Malley lived from 1992 to 2002, he stayed in the bishop's residence. It was in Palm Beach, where O'Malley has been bishop since October, that he made his most dramatic statement, reclaiming a small house by the cathedral that was being used as a convent and offering the nuns the bigger, fancier house used by his predecessor. Boston became a diocese in 1808, and its first bishops lived simply, usually in one room of a rectory adjacent to their church. O'Connor said the first bishop of Boston, the French-born Jean-Louis Cheverus, at first shared ''modest quarters'' with another French priest, Rev. Francois Matignon, on a lane that later became State Street. Then, at some point, according to a multivolume ''History of the Archdiocese of Boston,'' Cheverus moved to a small house, which the authors called a ''humble dwelling,'' in back of the Franklin Street church. That house was demolished in 1826 to make way for expansion of the church into a cathedral that could hold 3,000 people. Cheverus's successors, Bishop Benedict J. Fenwick, , who succeeded Cheverus in 1825, and Bishop John B. Fitzpatrick, who replaced Fenwick in 1846, also lived in modest circumstances in another small house just a short walk from Holy Cross, also without the benefit of a staff, O'Connor said in an interview. And that tradition was continued by Boston's first archbishop, John J. Williams, who was installed in 1866 and took a room in the small rectory of the Cathedral of the Holy Cross, on Union Park Street, when it opened in the South End in 1875. William Henry O'Connell, a man who appreciated the finer things in life, changed all that. O'Connell, who met Williams in 1882, studied in Rome, where he acquired the tastes that made it certain that when he succeeded Williams as Boston's archbishop 25 years later, he would not be stuck in such humble lodgings. In his book, ''Militant and Triumphant: William Henry O'Connell and the Catholic Church in Boston, 1859-1944,'' biographer James M. O'Toole says that when O'Connell became archbishop, a group of priests raised money for a new residence for him in more fashionable Back Bay. O'Connell saw the small rectory at the Cathedral in the South End as beneath his stature. In stark contrast to the austere lodgings of his predecessors, O'Connell's home at the corner of Granby Street and Bay State Road provided him with a combined residence and office -- not to mention a bankside view of the Charles River. In 1916, O'Connell moved to more spacious surroundings, in a nicer neighborhood, Fisher Hill in Brookline. Ten years after that, he built the mansion in Brighton. 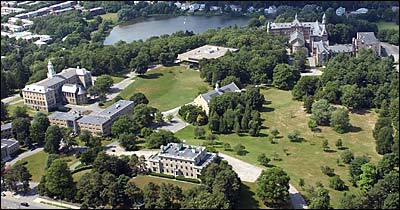 Ironically, in 1927, as O'Connell prepared to move out of his Tudor-style mansion on Brookline's tony Fisher Hill into the new Italian Renaissance palazzo in Brighton, the archbishop invited a group of Franciscan friars to convert his old estate into a friary. Now a Franciscan Capuchin friar has been named archbishop of Boston, and must decide whether to reverse O'Connell's decision, moving to humbler quarters. ''If O'Malley moves back into the city, I think that would go over well with many Boston Catholics,'' O'Connor said. Paulson can be reached at mpaulson@globe.com. Cullen can be reached at cullen@globe.com. This story ran on page A1 of the Boston Globe on 7/13/2003.